Perhaps the longest serving family to Sparsholt Cricket Club. 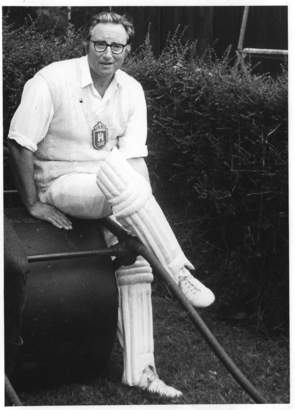 Norman Edwards (pictured), Joined Sparsholt CC in the early 1930's, just after inception, and continued to play an active part in the club until his retirement in 1997. His Son, Richard, started playing Cricket for Sparsholt around the age of 10, he left during the 80's to play Southern League Cricket for Hyde Ramblers and Winchester KS, but came back to the club as Club Captain in 1994. He has continued to play up until 2010 due to injury only to make a one game comeback in 2011 and had to step out of the spotlight again due to injury. However he is still involved behind the scenes as Vice-Chairman. Norman's eldest grandson, Tony has also played for Sparsholt, he didn't make his Sparsholt debut until he was 14, and has played games mainly in the junior and lower Saturday leagues and on Sunday's/Midweek. Though on two occasions he has been called onto the pitch to play for the 1st XI due to players being injured.... Both occasions happened at Leckford and I think it is only he that remember's it happening.... He too is very active behind the scenes as both Secretary and Webmaster. If Norman were around today, he would be still demanding those exacting standards regarding the pitch and it's preparation and would no doubt still give the occasional shout from the pavilion on the number of wides we have bowled.... He would also be encouraging his great grandson Matthew to get involved with the club, to keep the Edwards name and those standards running through the club for another generation.